Also called Imam Pasand, this is one hell of a mango. It is primarily grown in the Andhra Pradesh region in India. 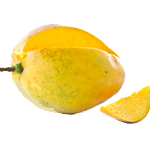 It is a large mango which is extremely flavorful and sweet. It is said to grow to really big sizes and usually wins the competitions for size, aroma and flavor. It is said to have been a favorite among the Nawabs of Hyderabad and is considered a delicacy in the Southern Indian states. This mango is considered to be royalty among the mango varieties available in the region. Some folks refuse to eat any other mango during the season. It is said that the mere presence of a good Himayat mango in the house, keeps is fragrant for days.